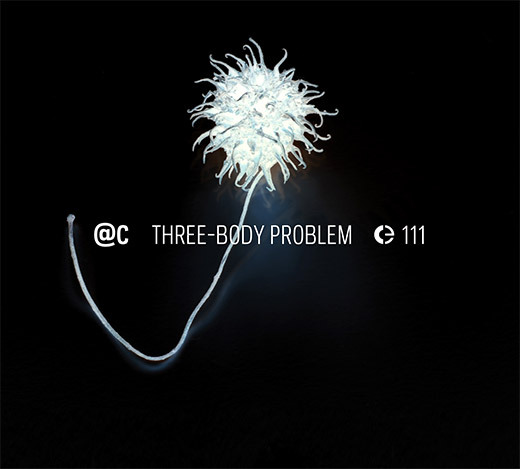 Now sixteen albums down the line, Portuguese duo @C continue to refine their own brand of subatomic click n’cut ambience with Three-Body Problem, which began life as Agapornis – another puppetry piece soundtrack (like Ab Ovo before it); one inspired by the writer Anaïs Nin. The title symbolises the logistical synergy of three phases of development: the first, a kind of bi-polar dialogue between two female puppets – described at least partly by the pairing of harp and trumpet – informing the initial structure. This underwent considerable post-performance revision in phase two, when musical collaborators (João Pais Filipe (cymbals and bells) and Ricardo Jacinto (cello and electronics)) added their voice, while still somehow facilitating the distillation of twenty-one tracks into just nine. This entry was posted in Reviews and tagged 111, @c, Miguel Carvalhais, Pedro Tudela. Bookmark the permalink. Comments are closed, but you can leave a trackback: Trackback URL.